‘Tamsin and her best friend Michelle have been inseparable since they were teenagers. Even now they spend all their time together, along with Patrick, Michelle's handsome husband. So when Tamsin hears a rumour that Patrick is having an affair, she is furious. Unwilling to ignore it, Tamsin plots a scheme to catch Patrick in the act, using her assistant Bea as live-bait. It should be fool proof. After all, Tamsin can trust Bea with anything. From her daily coffee order to fetching her dry-cleaning, writing reports and doing all the filing - Bea does everything with a smile on her face. Except Tamsin never considered Bea might have her own agenda. 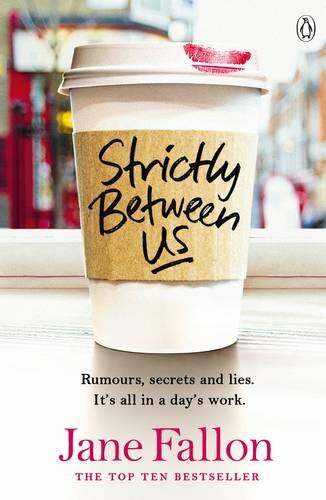 It may only be February but I’m already fairly certain that Strictly Between Us is going to make it onto my ‘best of 2016’ list. This was a real page-turner of a book from start to finish. So we know from the synopsis that Patrick is a questionable husband. What the synopsis doesn’t let you in on is that a drunken episode between Tamsin and Patrick occurs; this is revealed very early on in the novel, so I don’t feel I’m giving anything away here. I was shocked about this when Tamsin protests to be so close to Michelle, but oh boy does this lead to an interesting novel. The book is cleverly written. Despite what happens, Tamsin remains a likable character. This was so important to get right as it’s only her viewpoint we have insight into for the first part of the novel. Somehow, even though she’s done something terrible, as a reader we can forgive her. The arrogance of and manipulation by Patrick sees to that! Tamsin is in an impossible situation: She doesn’t want to lose her friendship with Michelle. which is so important to her, she can’t risk her finding out the truth, but then she doesn’t want Michelle to be putting up with a philandering husband either! What a mess! Cue Bea, Tamsin’s assistant who is amazing at her job and provides a listening ear to Tamsin whenever she needs one. These aren’t just colleagues, but good friends too, or at least that’s the way it appears to Tamsin. When Bea is sent on a mission to test Patrick, she reluctantly does so, but with what consequences...well these are unraveled slowly throughout the novel. Bea’s viewpoint begins to be introduced mid-way through the novel, a clever narrative structure. By this point we’ve built up an image of her, put her on a pedestal, and now it gets even more interesting. Question is who is going to play the smarter game in the end? And can there be any kind of happy ending for anyone? I was truly stumped as to how this novel could end happily for Tamsin and how she and Michelle would be able to maintain their friendship if all is revealed. I would say that the ending is satisfying, sad, but it felt very appropriate. What happened? Well I truly recommend this book so you can find out for yourselves. A fantastic read. Great review. I'm curious to find out how this turns out.